This woodblock print was produced from an original painting on silk dating from the late 1920s whose current location is unknown. The indentification of this design as number 21 is original to Rakusan who published the print as the 21st design in his series of one hundred woodblock prints called 楽山花鳥畫譜, Rakuzan Kachou Gafu, lit. 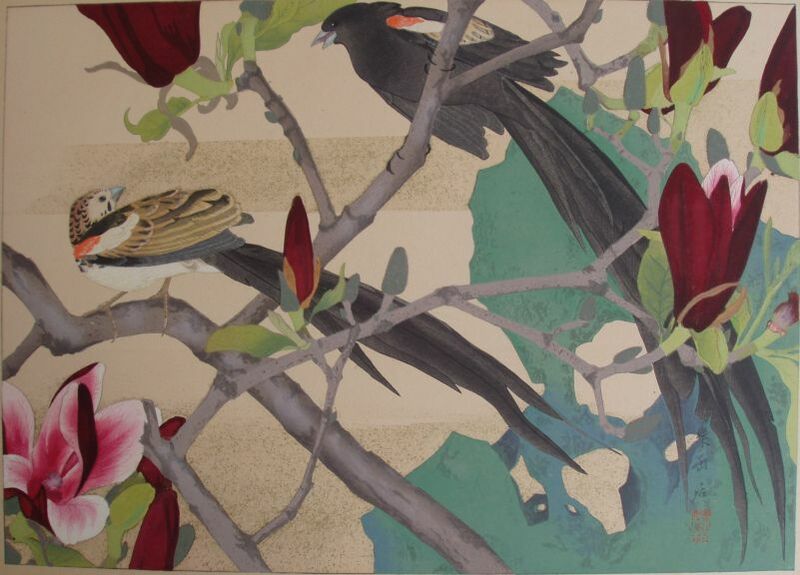 'Rakusan's Flower and Bird Print Series'. Initial edition I publication of 21 was in March 1930 (or perhaps slightly later) in installment eleven (of fifty). However, additional edition I reprintings may have continued until 1933. The copy illustrated here is typical of edition I. No later edition reprintings of 21 are currently known. This design is one of only two in this series which show large, decorative garden rocks as part of the compositions. The other is at number 52. 21alt, a woodblock print of an alternate sketch of the same design subject was issued the month before the initial printing of 21 as a preview advertisement (see Related Designs below). Purple Magnolia, Magnolia liliiflora, is a decorative flowering tree originally from China. In Japan it has been bred into many different named forms, but the majority of these are dark red-purple varieties such as Rakusan shows in 21. Therefore the addition of the descriptor 紫, 'purple', is optional and the name refers to the same variety either with or without it, (紫)木蓮, (紫)木蘭, (し)もくれん, (シ)モクレン, (shi) mokuren. Other names in English include: Mulan Magnolia, Red Magnolia, Lily Magnolia, Tulip Magnolia, and Japanese Magnolia (from where it was introduced into cultivation in the West). Long-tailed Widowbird, Euplectes (Coliuspasser) progne, 黒凰雀, こくほうじゃく, コクホウジャク, koku-hou-jaku, lit. 'black "phoenix" sparrow', is an African exotic popular for many years in Japan. Rakusan would have seen this bird in zoos and aviaries. In 21 he shows two differently plumaged birds which might suggest that they are a mated pair. However, both birds are actually males; the bird on the right is in full breeding plumage, but the bird on the left is still coming out of eclipse plumage and still has many brown feathers. In eclipse the male retains only his red and white epaulets, and otherwise shares the short tail and tweedy brown coloration of the female.